F-15Js have been equipped with the Japanese-built AAM-3 missile, an improved AIM-9 Sidewinder follow-on with distinctive "barbed" forward fins. Japan has been investigating an advanced fighter to replace the F-15, meanwhile the F-15J fleet is being modernised. On 28 July 2003, the first upgraded F-15J (#928) made its first flight, and it was delivered to the JASDF Air Development Test Wing on 21 October 2003. On 10 December 2004, the Japanese Government approved a Mid-Term Defense Program (MTDP) to modernize the F-15J MSIPs over five years in accordance with new National Defense Program Guidelines. The upgrade is being implemented in phases, but ultimately the upgrade will include a new ejection seat; replaced IHI-220E engines; more powerful processor; uprated electrical generation and cooling capabilities to support more avionics and the Raytheon AN/APG-63(V)1 radar which has been produced under license by Mitsubishi Electric since 1997. Raytheon expects the radar will ultimately be installed in 80 F-15Js. The new radar will support the AAM-4 missile, the Japanese answer to the AMRAAM. The Ministry of Defense (MoD) requested the modernization and deployment of reconnaissance aircraft in June 2007, and it was planned to upgrade some F-15Js with synthetic aperture radar pods; these aircraft would replace the RF-4 Phantom IIs currently in service. On 17 December 2009, the reconnaissance upgrade disappeared from the budget after the Democratic Party took power following the General Election in 2009, and priority was given instead to improvement of the F-15J and the Mitsubishi F-2. The number of F-15J upgrades was increased from 26 to 48, and the MoD purchased the part of the modernization for 38 fighters, however, the full budget for modernization is incomplete. 48 F-15Js will get a Link 16 datalink and helmet-mounted sight. The helmet-mounted sight will support the AAM-5 dogfighting missile, which will replace the AAM-3. On 17 December 2010, modernization was funded for 16 F-15Js but the MoD reduced this to 10 F-15Js. This is the second of two new tool F-15 kits released by Platz. The first boxing was a standard pre-MSIP aircraft while this one contains the additional pieces to do an MSIP I or MSIP II aircraft. The instructions indicate what is different in this variant. The original bits are also included so one could do the earlier Eagle using the parts in this kit. 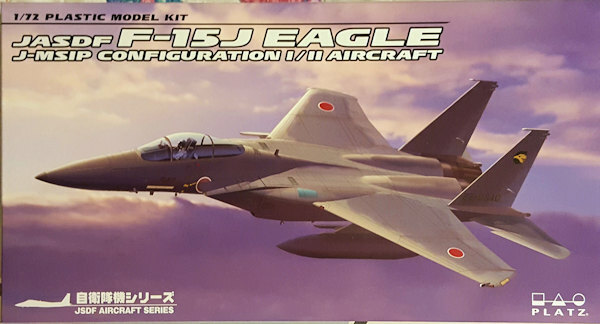 This is the first new tool Eagle I have seen since Hasegawa released theirs quite a few years back (there may have been others, but I have not seen them). There is a definite difference in the surface detailing between the Platz and Hasegawa kit. 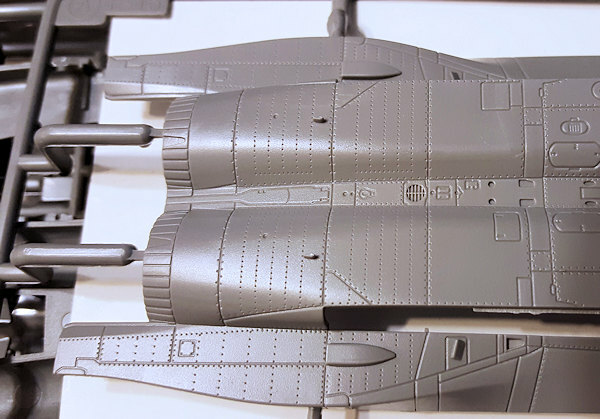 For one thing, there is more of it on the Platz kit, however, I have to admit that the panel lines and rivets are not as petite as what Hasegawa provides. Now this may well put off some modelers, however, I have found that once one add on the paint that this effect is softened considerably. The actual breakdown of the kit is a bit different from other F-15 kits I've built in this scale. Not greatly different, but with some features you will appreciate. It is nearly impossible to mold a plane like this without having a separate nose section as this is the most logical way of doing it and allows for easy two seat options later on. I think that any smaller scale Eagle fan will like how Platz has molded the cockpit area. One option for the builder is to do the plane assigned to the test unit. This aircraft has an infrared receiver on the nose like you see on F-102s and F-106s. This is not (yet) standard equipment. It means holes need to be opened for it right from the start. Attached to the back of the nose section is a large piece with pegs at the top and bottom. This becomes important later. Something new to me is that Platz provides full intake and exhaust trunking. See-through is prevented by both first and final compressor stage fans. This is then trapped between the upper and lower fuselage section. Most of the side of the fuselage is open and this will contain a long insert that also has the initial part of the intake trunking. Once that is together, one notices a large receptacle on the lower forward fuselage. The large piece with two pins attached to the nose section fits into the bottom and is capped by a piece that fits atop it. This basically locks the nose in place and should forego any alignment issues. The intakes can be built with the upper ramp straight or angled down. When the engines are running, this is usually down. On the side of the intakes are some ECM blisters that other Eagles do not have. This is part of the MSIP upgrade. Also part of the upgrade are rear fuselage pieces that have antennas on them similar to what the Strike Eagle carries. The originals are also provided as the test plane does not have these antennas. The exhaust have the somewhat complex open burner cans with the individual links showing. Wings are a full upper and partial lower piece. If you want to carry wing pylons, holes need to be opened. Separate ailerons are provided. The fins are a single piece as are the stabs. Landing gear are suitably complex and you have to glue the forward main gear doors closed once the gear is installed. For dangly bits, you have the fuselage mounted AAM-4s, wing pylons holding two AAM-3s each. Centerline and wing fu el tanks are also included. Note that to install the centerline pylon, you'll have needed to open the holes for them early in the build. Instructions are very well done and a tad crowded. 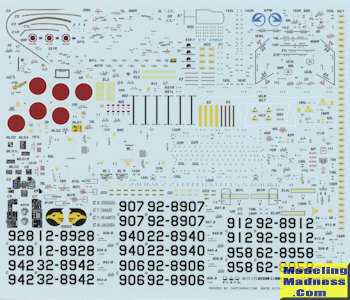 Color info is provided via Gunze and Model Master paint references as well as FS 595 numbers where appropriate. Japanese Eagles are in the old color scheme of FS 36320 over 36375 so the colors will be pretty close. According to the instructions, so far only eight planes have been fully updated. One is the test bird and the rest are with 306 Sq. Serials for seven planes are provided along with the usual mass of stencils that festoon Eagles. Fortunately, these data markings are often in groups so you won't be going too wonky installing teensy decals. Decals look to be quite nicely done and are printed by Cartograf. I realize that there are not a whole lot of Eagle builders out there. For some reason, the type just does not inspire that many modelers, though it is a cool aircraft. This particular kit will provide the opportunity to build a variation that is not seen elsewhere. While it does have a lot of parts, the engineering seems to be quite good and so it may well not take as long as one would think. If one is saying 'Hey, I can build a US Eagle from this', well in order to do that you'll need different fins, so go with the flow and having something a bit different on the shelf. My thanks to Platz Model for the preview kit. If your local retailer doesn't carry it, ask them to order it for you.